We woke up at an old post office in Dyrdal, Norway. I’m still trying to let that sink in. After breakfast it was time for fjord hopping. 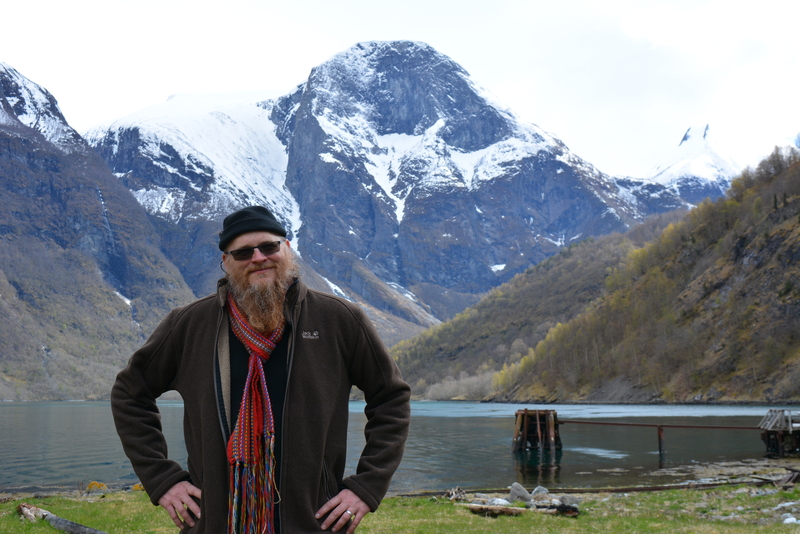 Obviously this was optional, and in talking with a few locals and members of the crew, no Norwegian in their right mind hops in a fjord in April, but I wasn’t about to come all the way to Norway as a cast member of Alt For Norge and not jump in the fjord! It was incredibly cool to jump off the dock into the icy water – one of the most spectacular backdrops I’d ever seen (I anticipate they got some great footage). It was also incredibly cold. After a couple of jumps, it was time to shower up and get ready for the rest of the day. We had a briefing with Fridtjof on the patio of the girl’s house overlooking the fjord. He tells us we’ll be going to Undredal, a town known for having the smallest and oldest stave church in Norway. 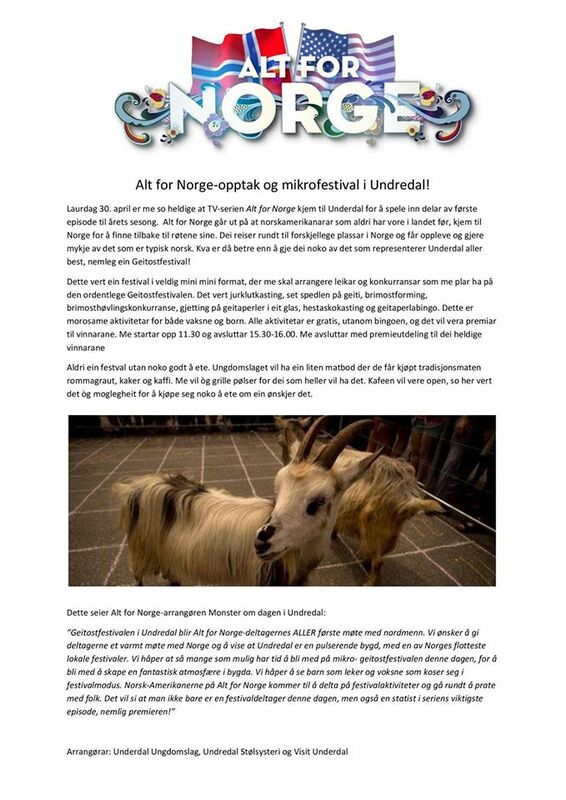 But more importantly, today in Undredal they’d be holding a goat cheese festival! Gjetost! I LOVE gjetost, so to have this right off the bat is going to be a blast. On the boat ride to Undredal, we pick up two goats who we’re in charge of bringing to the festival. Chasing these goats around the slopes of Norwegian fjords and trying to coax them onto our little boat was a blast. Arriving in Undredal, we were greeted by throngs of people – interesting for a town that has more goats than inhabitants. It turns out that the real Gjetost Festivalen takes place every two years in July, however for Alt For Norge they decided to switch up their schedule and throw in another festival for us at the end of April! Many of the people we met had traveled hours to be there and to be a part of Alt For Norge! The town of Undredal was gorgeous. Incredibly picturesque with amazing fjord views. The food was delicious – particularly the homemade goat cheese, and the rummegrot (which I hadn’t had before). The Stave church was as advertised – built in 1147 with wood still in use from 1697!!! It was built ~350 years before Columbus sailed to America! Unreal! Most of all though, the local Norwegians we met were so welcoming and excited to teach us about both their culture and their land – it was really special. After a ~4 hours in Undredal, it was back to the boats and back to Dyrdal where we were filmed “arriving” for the first time (because it was too dark to film last night.) Yet at this point something weird was going on – we were summoned to a field and told not to walk around or explore, that we had to wait for something. We saw people moving around in our house from the previous night but couldn’t exactly make out what it was. Eventually a large barn door opened for our surprise. We walk in, and we see lutefisk beer, lutefisk aquavit, lutefisk bibs, and then suddenly, the Lutefisk Society arrives! Uh oh! I’ve had lutefisk before. It’s not good. I come from Seattle where we eat lots of fresh fish. I love fish, but this is a waste of fish. I mean really, lutefisk came to be because in the olden days before the advent of refrigerators, the Scandinavians needed a way to store their fish without it rotting. Their genius solution was to leave it in lye, which is essentially a poison used for cleaning. Long story short it’s not my cup of tea and I’m not going to pretend like it is. Lutefisk is served, and it’s as gelatinous as ever. Ick. I make my feelings known, at which point the Norwegians put a shot of aquavit in front of me. Okay I’ll throw one back to make it go down easier. Whoosh! At which point they immediately pour me another shot. “Hey now I’m not that guy who just throws back aquavit so easily, I’ll only take another if you do one with me.” The member of the Lutefisk Society pours himself a shot as well, we skoal, and I throw back shot #2. It’s only at this time I learn that aquavit isn’t for shooting, it’s for sipping! Great, now I look like the crazy American who just can’t wait to drink drink drink! Next up we do some real weird ceremonial ritual, whereby “awards” are presented to Kate, Derrick, Heidi, and Jeff. The awards in actuality aren’t based on anything – Joni at a ton of lutefisk, it was all for TV sake. This is really our first glance into the business side of things in my eyes. We’re not playing a game with a super rigid set of rules, this is an entertainment show, and the show wants story lines and people who make good TV. It’s not a complaint, but a reality that Kate, Hedi, Jeff, and Derrick make for intriguing stories and/or TV. My hope is that the show is 100% copacetic, but it will be really interesting to see a “reality” show from the inside looking out. It’s a view that very very few people ever get. By this point it’s late, it’s been an enormous day, and we jump back in our fjordsafari boats and head the 25 minutes or so back to Flåm. A few people head back to the stave church bar, but I’m dead tired and immediately pass out.